You probably know that global warming is the result of carbon dioxide (CO2) and other greenhouse gases (GHG) levels rising in the Earth’s atmosphere, and that industrialized societies need to sharply curtail their GHG emissions. Millions of people are busy doing this by moving towards fuel efficiency, driving less, retrofitting buildings, conserving energy and scaling up renewable sources of energy like wind and solar. But did you realize that climate scientists identified 350 parts per million (ppm) as the safe upper limit of atmospheric CO2 yet we’ve already crossed the 400 ppm mark? We are 50 ppm above the safety zone! This means to avoid runaway climate change, we need to do more than curtail emissions; because even if we miraculously ceased emitting all GHGs tomorrow, we’d still be in dangerous territory. We also need to store or “sequester” the excess carbon that has already been released – i.e. that extra 50 ppm. The good news is we can enlist nature’s help. It turns out that healthy, living soil has an enormous capacity to store carbon. In fact, carbon stored in soil accounts for roughly three times the amount stored in the atmosphere! Given this astounding fact, it stands to reason that improving the health of the planet’s degraded soils holds tremendous potential to mitigate, and some believe even arrest, climate change. 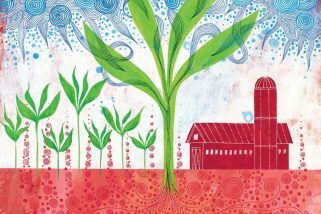 Scientists are just learning about soil’s sequestration capacity, and as a result estimates vary widely on exactly how much carbon we can store in the ground. However, conservative estimates indicate that with proper management we can sequester at least 50 ppm or enough to get us out of the danger zone! (Provided, of course that we also stop putting so much carbon dioxide and other heat-trapping gases in the atmosphere). We can get to work by building soil organic matter (SOM). Building SOM increases soil fertility. Indeed, there is a correlation between the fertility below ground and the fertility above ground: the more plant life or biomass that soil can support, the more carbon it can potentially store (until it reaches a state of equilibrium). There are a wide variety of ways to get carbon out of the atmosphere – where it is a problem and back in the ground where it is a solution. Check out our Take Action section to learn what you can do to help.